An Original Oil Painting inspired by Belingrath Gardens and Estate in Theodore Alabama, a beautiful themed garden along the Aux Oies River. It was published as a poster and is no longer in print. We have 1 hand embellished canvas litho available and 25 posters signed in gold ink. 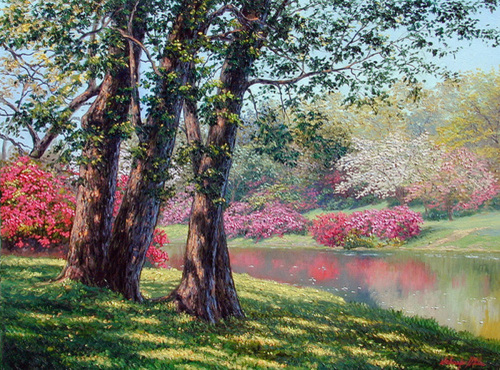 This breathtaking scene features large trees along the banks of the rive that reflet the brightly colored flowering Azaleas in the spring. Definitely on of our favorite places to paint!